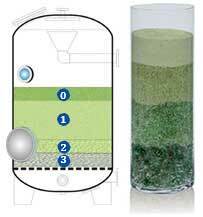 Activated Glass Filtration Media replaces traditional sand media in all filtration applications. It is manufactured from a specific glass type and processed to obtain the optimum particle size and shape, and then activated to increase the surface area by 300 times over crushed glass or sand. The high surface area is negatively charged (zeta potential) to electro-statically attract organics and small particles. 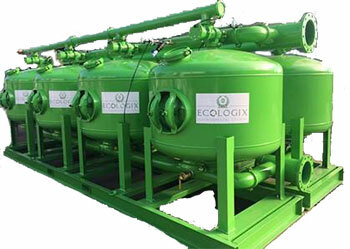 It also has permanent metal oxide catalysts, creating a high redox potential, to make AGFM self-sterilizing. 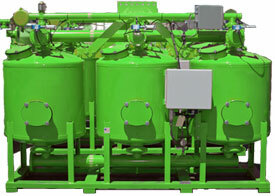 AGFM is a direct replacement for sand in your media filters. Our media has a 15% lower density than sand by weight. This means you will require less of our media by weight than the equivalent sand. IMPORTANT NOTE: Before first use of AGFM backwash the media for 10 – 15 minutes 3 consecutive times with potable water and then rinse it for a further 1 hour.